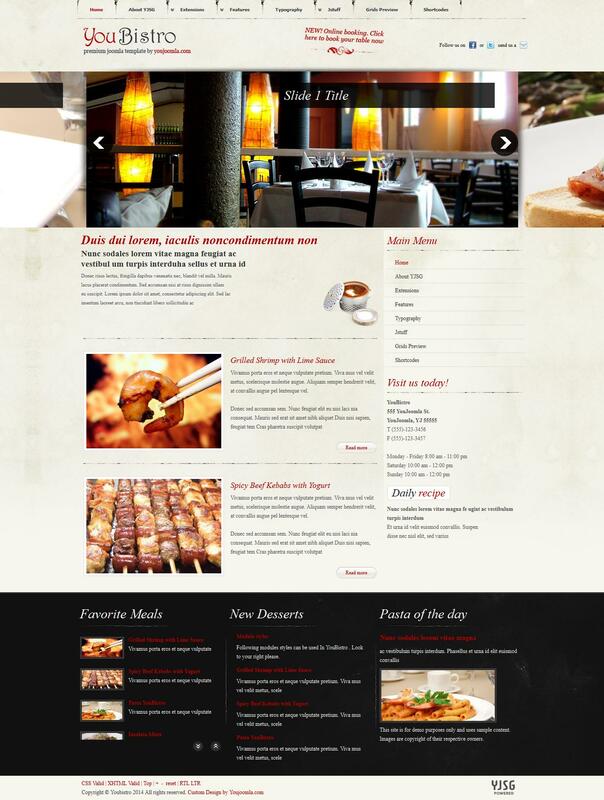 YJ YouBistro - conceptually new restaurant template from the studio YouJoomla. The template has everything you need to profitably submit your bar, restaurant, club, snack bar, etc. Proprietary extensions such as, YJ Contact us help you create a reservation form, and YJ Newsflash 3.0 and YJ Newsflash 5.0 graphically and dynamically present their photos and images. Support component K2 and styles to it. SEO template uses functions in all modern browsers, has 51 module positions, 5 combo style CSS, smooth dropdown menu, split menu, the compression on the server side, additional printing styles, adjustable width.